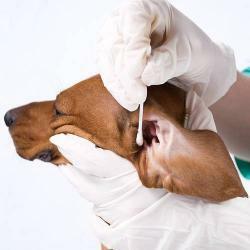 An ear infection occurs when an organism outside of the body enters an animal’s outer ear causing the skin and the blood cells in the area to react with an inflammatory response. In your dog, this means that the ears become red and warm to the touch, you may notice some swelling and discharge, and you may be able to detect a slightly musty, unpleasant smell coming from your pet. In addition, your dog may start scratching and rubbing at her ears due to intense itching. Typically caused by either bacteria or yeast, these types of infections can come on very quickly, and if not treated, become a chronic problem that can lead to other issues, including vestibular disease – a middle-ear infection that can cause nausea, head tilt, and a stumbling gait, and permanent deafness. While almost all dogs will at some point in their lives suffer from some type of ear infection, they are most commonly seen in animals with drooping ears, longer hair coats, and those dogs with an inordinate amount of hair in the outer ear. The extra hair allows bacteria, and yeast – a microscopic fungus – to grow and thrive in the natural moisture found in your dog’s ears. Most veterinarians will prescribe a regimen of either topical antibiotic drugs or antifungal medications to be dropped into your pet’s ears 2 to 3 times a day for 10 days to 2 weeks depending on the cause of the infection. The overuse of both antibiotics and antifungals can cause your animal’s immune system to build a resistance to the drugs, leading to them becoming virtually ineffective. The first step to helping your dog prevent and eventually overcome her ear infections is to make sure her ears stay dry. This means keeping cotton balls in them when you are bathing her, and drying them out with a soft towel if she happens to be out in the rain. You will also want to keep her ears as free of hair as possible, either by cutting or plucking it out yourself, or allowing your groomer to do it. Since ear infections often go hand in hand with food allergies, your next step in preventing them should be to put your dog on a sugar-free, grain-free kibble diet. The corn and wheat glutens found in most commercially made dog foods tend to exacerbate problems with yeasty ears and, in some cases, yeasty skin. By altering the pH balance of your dog’s ear, you can combat any bacterial or yeast infections. A basic, all-natural ear cleaner can be made at home to change the pH and destroy any contaminants in the ear that may be giving your dog problems. Mix ¼-litre of luke-warm water with 2 tablespoons of either hydrogen peroxide, apple cider vinegar, or white vinegar and pour into a clean plastic bottle. You can add a few drops of Tea Tree Oil to the solution; just make sure you shake the cleaner to mix the ingredients every time you use it. Soak cotton balls or soft cotton pads in the natural ear cleaner and wipe out excess debris from visible areas of your dog’s ear. Make sure you don’t push anything into the ear beyond the folds of the ear canal that you can see with your naked eye. Never poke cotton swabs or anything small into the ear canal and never pore large amounts of this solution into the ear. Several drops on a cotton ball is typically sufficient to keep your pooch’s ears clean and healthy. Please Note: If you notice your dog continues to have ear infections after using natural solutions, make an appointment to see your vet for an ear exam and medications. Deafness can result from untreated ear infections.